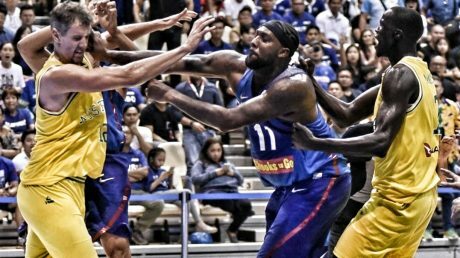 Pinoy Pride: Gilas ‘The Andray Blatche Show’ Pilipinas at a high sporting point. What can I say? Philippine sports mirrors Philippine life. The unclassy behavior of Gilas Pilipinas broadcast to the whole world the other day reflects the way Filipinos regard their national sport. This is, after all, a sport played on any large enough hard surface that could be found across the country. Watching a barangay league game, in fact, is no different to the level of play that can be seen on TV delivered by what are supposedly the Philippines’ elite players. Filipinos’ basketball game is aptly described as all puso (“heart”) and barely about team. In this case, they make “heart” sound like it’s a good thing. Like everything else Filipinos apply themselves to, more emotion is poured into playing basketball than any kind of science that helps real winning. Pa-astigan seems to be the rule. This whole episode with the Australian team shows that there is not much that can make emotions boil over shattering the paper-thin veneer of sportsmanship that separates Gilas from the corner tambay team. At least tambay basketball games make sense. The teams are made up of kabarkadas and neighborhood jocks. As such, they are fun to watch even if there is one or two relative standout players. But the standout players don’t steal tambay games as much as the imports in top league teams do. Here is what I cannot understand about our over-reliance of imports. People will argue that these hulking imports gel well with their local teammates. Sure they do. But when you look at the stats, the numbers tell a different story. The imports in these teams account for the lion’s share of points and assists. That’s not a team, that’s an import playing with a supporting cast of local players, lol! Gilas, for example, is not really a Philippine team — more like the Andray Blatche Show to me! Kung baga if Filipinos always need a Blatche in their team to win, then this is a sport that they simply lack the physiology and DNA to excel in on the world stage. That’s not to say Philippine basketball does not make business sense. It obviously does in the same way Eat Bulaga makes perfect sense as an ad magnet. Eat Bulaga is not a world-class TV show, but a country of 100 million hooked on the sort of entertainment it provides serve its shareholders well. Same with Philippine basketball. It makes sense as a domestic enterprise. Filipinos are sufficiently entertained by Filipino-grade basketball to make promoting and exhibiting the sport a lucrative business. The trouble is, the ambition to scale Philippine basketball to an international audience is not matched by capability. It’s like trying to export a jeepney. You can put an imported engine in it, but it will never beat even an entry-evel Hyundai in the international market. Just like how building jeepneys never actually evolved from being a tambay industry, we will never see a truly world-class Filipino basketball team as long as we continue to apply a tambay approach to developing, recruiting, and training players. All you’ll get for that trouble is a team of well-fed and well-paid players who remain tambays both in terms of basketball skills and grace and in general sportsmanship. Throw in the underlying tambay manners and we get that spectacular brawl we just witnessed. let me ask you, writer … when do you really RESPECT your host ? when they already evolve out from being a monkey ? All that matters here is Australia cares more about soccer, cricket, rugby , Aussie rules football than they care about basketball. Pinoys only care about basketball. What was the score??? Eat Bulaga pa more!!!!!!!!!!!!!!!!! !Proud to be pinoy!!!! Keep focusing on basketball! Your approach works!!! Philippine basketball was never successfull quality wise. We use to be one of two asia’s best . But now inspite of an nba import and a host of afro-americans running the show with our big headed local boys as salingpusa, it is increasingly becoming impossible regaining our claim as the top team in a region were the number one sport is not even basketball. The PBA where most of this players came from is for local consumption only just like like the products they wear on their jerseys. Not the export kind. Only in the Philippines when sports became a weapons of war. But when it comes to a REAL war (like we will declare a war against China due to the Spratlys issue), we become cowards & divided. That’s a BS to me! ???? >> That’s not a team, that’s an import playing with a supporting cast of local players, lol! Pretty much sums up the whole country, doesn’t it? One of the saddest events in the country’s history, IMO, was the expulsion of American businessmen during the Marcos administration. Whatever else he did or didn’t do, that definitely happened, and the result was unequivocally negative. At the time, the arrangement was very similar to the one China mandated for foreign investors in the 1980s-90s: come here and make some money, but show us how you do your stuff. Despite massive political corruption and repression in China to this day (very little different to the Philippines), China is nevertheless economically successful. That happened because they allowed foreigners to teach Chinese people their skills. Not just technical skills, but cognitive skills too: ie., how to think clearly about problems and how to solve them with reason and logic. It’s often remarked that Filipinos have a low IQ. This is undoubtedly true, but the deficit is mostly due to a lack of symbolic manipulation skills: I’ve noticed that Filipinos with otherwise normal general intelligence (high ‘g’) have few or no skills of this type, reducing their overall IQ. If the Americans had been allowed to do their job, they could have left the country in much better shape. While I did graduate with honors, I really wished I could have gotten more out of my education. I really enjoyed Mathematics because I only need to know the basic formulae then apply it different ways based on the problem. My weakest subjects were those that I have to memorize a bunch of stuff then spit it all out during exams, like History. Now working with software, most of what I use now are what I have learned through actual work training. I don’t exactly mean to brag my achievements, but I guess I wanted to show that not all Filipinos are stupid. While I lean on disliking the Filipino society in general, that doesn’t mean I dislike Filipinos as specific individuals. I just hope you don’t think that ALL Filipinos are so irredeemably stupid and rotten it would have been better if we got wiped out by nukes (going around the internet, I actually saw Westerners post this kind of sentiment). “Tambay” because Filipino. The Australians? I mean, when did we ever call NBA players “tambays” for starting brawls in court? How about European football fans who literally start riots fighting each other in stadiums where their teams played? This article espouses the same mentally where if an ugly guy flirts with you, he’s a manyakis. But if the guy is attractive, pwede. What about sports where Filipinos excel? Dragon boat rowing, and maybe softball, weight lifting, boxing, and others? Basketball is so much hype. Besides, spectator sports is just for marketing products. Better not to buy into it. Oh wait, perhaps the support is less for Filipinos winning in other sports and more for our losing team in a hyped sport because Filipinos love to celebrate losers. Because it more suits the mendicancy mentality of Filipinos. Hi Kate. I noticed in the GRP FB page that your post drew out a lot of vitriol. I am proud of you. Since a lot of it was directed to those of us who dare venture into sports I answered a few here on my most recent post about basketball. Thanks. Actually just on my own social media, I see more condemnation than support for Gilas. It’s only in the page that I saw that vitriol. Goes to show that who we follow don’t necessarily represent society at large. So many fans just don’t get it… ???? Better yet, I am putting the finishing touches on a piece that addresses the people who feel GRP should never write about sports. I do that by writing about sports. Those who are more in support of Gilas tend to be sportspeople of employees of such themselves, such as a classmate who works as a coach. Even on the FB group, someone was more supportive of retaliation against a nasty foul and so defended Gilas’ brawling attack. I understand where they’re coming from, but at times it makes me wonder whether involvement in sports does increase aggressive tendencies of people. Well, I mentioned that in my article that I just put up. Tambay is an ugly word in Pilipino. It is a word that describes the Indolence of the Filipinos. Some of us are really indolent. So, the Indolent people, were hooked to basketball games, fitted for their Indolent nature. It’s Tambay Barkada versus another Tambay Barkada, in the neighborhood. If they find the itch to fight each other; the Basketball game, could turn into a “BasketBrawl ” game. To have a neighborhood basketball teams. All you have to do , is recruit the Tambays from various gangs; have a piece of land. Build a basketball court. Recruit a referee. Change the names of the local gangs, into local basketball teams. Then, make them play. If it descends into a brawl. It is part of the sport. What you see in the last “Basketbrawl” is the common brawl, that can take place in some Tambay Barangays. It just made a headway to an international league. We should do better things than just playing that Tambay basketball game. We will never excel in any basketball game, because of our heights, and lack of sportsmanship. We should focus our minds to better things ! Very nice insight on Gilas hoops/local sport especially coming from a girl. I agree with “Puso” (Heart) and how they try to condition/set our mind (brainwash) to be emotional (e.g. soft hearted-maawain/mapagmahal/kaawa-awa/balat sibuyas and/or full of emotional outburst). Basically the same way they do on local radio/telenovela and movies. Imports like Andray Blatche is here to remind us (inferiority complex) that foreigners (e.g. Americans) is always better (bigger/taller/faster/stronger/smarter) than Filipinos not only in Basketball and we must must/should always seek help/support (reliance or dependency). Basketball in the Philippines will not improve because PBA ( our major league) is controlled by team owners mainly for commercial or advertising purposes (e.g. San Miguel/PLDT) and not for basketball excellence. Notice that star players or best foreigns coaches (e.g. Ron Jacobs) is not that highly paid in comparison with NBA or during the time of Robert Jaworski and other retired local players that was replaced by FilAm or players with foreign blood. Basketball is indeed a “Tambay” sport in the Philippines. You just have to go to any back/front yard of every home and you can find an impoverished “court”. If no “court” available for tambays to play, they go to any street to play this badly formed sport. Why do the Filipinos insist on playing this sport when they know perfectly well this does not lead them anywhere for their personal progress? Shouldn’t they plant “Kamote” instead? At least this gives them something to boil and eat. I’m not underestimating them, but I know planting “Kamote” could be their source of income and forget the “court” altogether for good as this has been proven that basketball is not for Filipinos – besides they’re so short. This type of mindset is just the same as to what GRP writers are complaining about: Trolls telling them what to write about. These tambays want to play basketball. That’s all there is to it. Now you are telling them not to play at all because, to you, they shouldn’t.